Map by Evan Centanni, based on materials submitted to the court. Contact for usage permissions. What happens when two countries draw their border along a river, then the river changes course? The world got to find out yesterday, as the UN's International Court of Justice (ICJ) released its judgement on a border dispute between Nicaragua and Costa Rica. 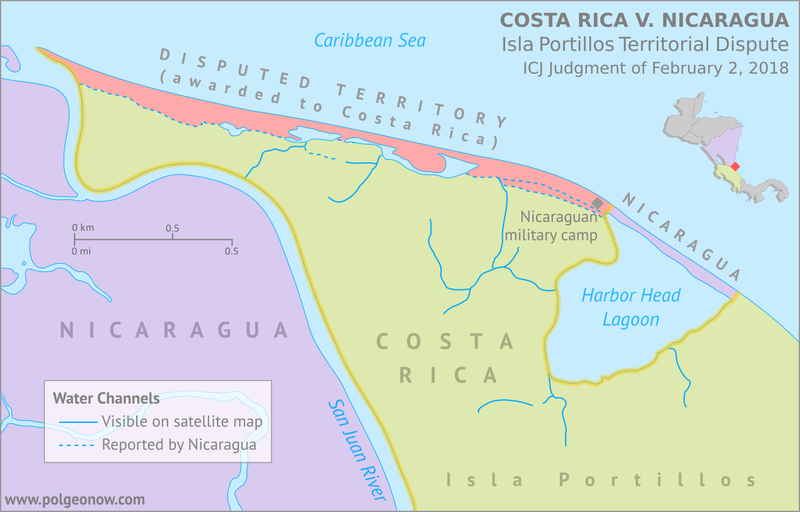 Though the court's ruling was dominated by a related request to define the two countries' borders at sea, it also involved a tiny sliver of land in a temperamental river delta. Two weeks ago, the International Court of Justice released a long-awaited ruling on Peru and Chile's disputed maritime boundary. Many headlines claimed that Peru "won" the case, but in fact it was not a full victory for either country. 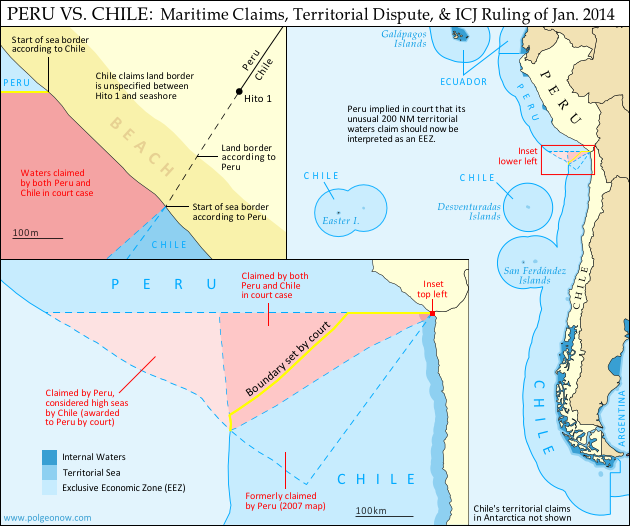 Below is our detailed map of Peru and Chile's seas and of the dispute, followed by an easy-to-understand summary of the case. Premium members click here to view this article in the ad-free members area. Not a member yet? Subscribe now! Chile and Peru have just settled a decades-long dispute over the location of their maritime boundary (the border between their sea zones). A large wedge of sea off the countries' coast was claimed by both sides, in part because of its high value for the fishing industry. In 2008, Peru took Chile to court over the dispute. Their disagreements would be resolved by the International Court of Justice (ICJ), a United Nations body in the Hague founded for the purpose of settling differences between U.N. member countries. Update: In May 2015, Niger and Burkina Faso formally agreed to implement this ICJ ruling, with the practical aspects of exchanging territories to be completed by the end of the following year. Map by Evan Centanni. Sources: ICJ, Natural Earth. Africa inset based on this map by TUBS/Wikimedia Commons (CC BY-SA). Last week, a territorial dispute between the West African countries of Niger and Burkina Faso was resolved peacefully with a ruling from the International Court of Justice (ICJ). Both countries' governments agreed to respect the court's ruling on where their border should lie, a question which had persisted ever since they both achieved independence in 1960. In the ruling, the court drew an official border based on a careful analysis of a 1927 document establishing the pre-independence boundary between the two former French colonies, also turning to a 1960 French map which both countries had agreed to use as a secondary reference. 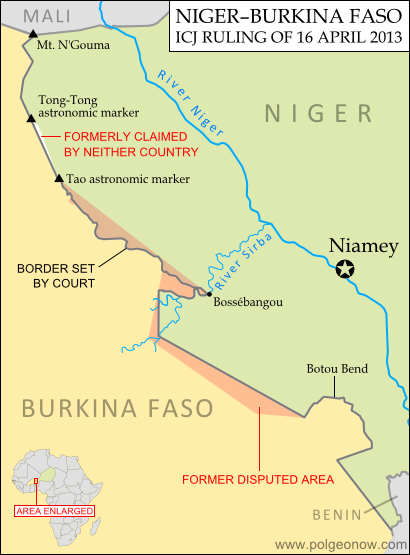 The new border splits the disputed area between Burkina Faso and Niger, and will help put an end to confusion regarding policing and tax collection in the border area.